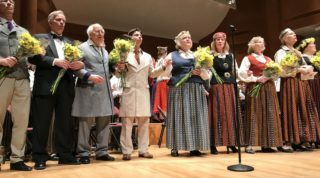 Latvians Online asked a few Baltimore Latvian Song Festival goers to share their thoughts on the festival. Canadian Latvians regularly attend US-Latvian song festivals. Here is one active younger-generation Canadian-Latvian’s take on the week of festivities in Baltimore. To someone who has never been, you can’t really describe the feeling of being at a Song Festival: the feeling of being amongst thousands of other Latvians, all wanting to celebrate our beautiful culture together. It doesn’t matter if they were born here, or in Latvia; if they’ve married into the community or were born into it; if they’ve lost the language or still hold onto it. It doesn’t matter if you’ve known them for years or if you’re just meeting them for the first time. What matters in that one magical weekend is that you are all together; that we as Latvians can take over a city and call it our own. As cheesy and trite as this may sound, that doesn’t make it any less true. Even for those coming from cities with active Latvian communities, like me, hearing Latvian all around you on the streets lifts your spirits like nothing else can. There is no greater sense of pride than walking down the streets of Baltimore (or any Festival city) in your folk costume and answering locals who ask “what’s the big event that’s happening this weekend?”. The sense of community that is felt at a Festival cannot be replicated or replaced by anything. Though the weekend may pass by in a blur you always wish there was just one more day, to go to another show, to visit the market again, or to grab lunch with friends from out of town that you haven’t seen in a long time. I have friends who, for various reasons, come to Festivals not as participants but merely as attendees. While I am always jealous that they get to sleep in and can attend any show or concert they would like, I somehow cannot imagine being at a Festival and not participating in some way. I have been folk dancing my whole life and because of that Festivals have always included at least one day (if not three or four!) of early morning rehearsals and long days spent dancing on tired feet. One day I might decide to retire my dancing shoes, but for now I live for the rush of being onstage with hundreds of other dancers; with beaming, cheering crowds cramming every possible seat. My favourite moment at any Festival comes just before the end of the Folk Dance Show. With all of the dancers on stage, everyone, performers and dancers, join hands and sing “Daugav’ abas malas”, an anthem of sorts for Latvians, especially in the diaspora. Since I was a child, I have not been able to get through this moment without tearing up and in some cases, full-out weeping. After this deeply emotional moment, upbeat dance music is put on and the dancers onstage take their time polka-ing off in pairs, lines, groups, or however else they’d like. This brief but wonderful moment is a chance to celebrate the culmination of all our hard work together and to relax and look forward to enjoying the remainder of the Festival. As much fun as dancing in the New Choreography Competition and the Folk Dance Show was, I also enjoyed being able to spend my last day in Baltimore simply as a spectator. The final day of the Festival was a beatiful one – the Joint Choir Festival was magnificent, with wonderful acoustics at Meyerhoff Symphony Hall, a talented accompanying orchestra, and a great selection of choral favourites and unknowns, including a celebration of East Coast composers. And the final Festival Ball was a great culmination to such a joyful, vibrant weekend. The room was packed full of festival goers of all ages, dancing to Toronto’s own Penzionāri. I even spotted Ilga Reizniece of Iļģi dancing too. During a break in between sets, Dace Melbārde, Latvia’s Minister for Culture (and a Festival participant as well!) gave Certificates of Recognition (atzinības raksti) to the Festival Organizers. These were extremely well deserved and showed the new, stronger bonds being forged between Latvians abroad and those in Latvia. Working together and supporting one another can only strengthen us as a people and a culture. It’s been said before, but I must repeat how amazing it is that the Festival came together like it did, considering the fact that the organizers are all from different East Coast cities and that the Latvian community in Baltimore is so minimal. Never once did it feel like they did not know the city or that they hadn’t prepared everything and planned it all to the T. My hats off to all of the Organizing Committee and volunteers. As a first-time member of a Festival Organizing Committee (for the 2019 Festival in Toronto) I am beginning to see just how much blood, sweat, and tears goes into planning an event of this scale, something I think many Festival goers, through no fault of their own, simply do not realize and take for granted. It takes a lot of work to make sure things run as smoothly as they did and to ensure that all Festival participants and attendees are able to enjoy everything to the fullest. Given how wonderful my experience in Baltimore was it’s such a shame that Festivals don’t happen more often. But, while the next East Coast Festival might be far away, and going to the Festival in Latvia next summer might not be possible for everyone, there is another North American Festival just around the corner. Yes, as a member of the Organizing Committee for the 2019 Festival of Song and Dance in Toronto, this is my shameless plug for everyone to join us there. It’s a chance to once again experience the friendship, community, and cultural beauty of the Latvian community here in North America and around the world. I am looking for a Latvian DP family who came to Lynn,MA, about 1950. They gave me their daughter’s doll. The daughter was killed in the fighting. I would like to return Nadia, if not to her direct family, at least to her culture. Can you help me please? She is a lovely doll.